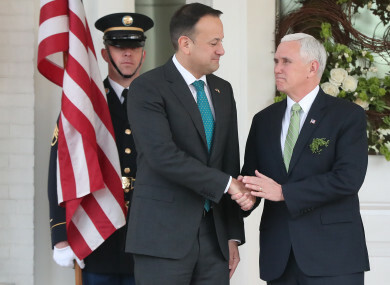 Taoiseach Leo Varadkar with US Vice President Mike Pence last year. REVERTING BACK TO tradition, the media will be allowed to attend the breakfast briefing between Taoiseach Leo Varadkar and US Vice President Mike Pence this year in Washington DC. It is tradition during the St Patrick’s Day trip to Washington DC for the Taoiseach to have breakfast with the vice president. Generally, this is done the morning before the Taoiseach meets the US President in the Oval Office. This week both events will take place on Thursday. Last year, breaking with the tradition of allowing the media access to the conversation, the press were left on the lawn of the vice president’s home. At the time the Taoiseach said it was the US administration that made the decision to have the meeting in private. Prior to the meeting, Varadkar repeatedly said he would talk with Pence about social issues, including LGBT rights. Varadkar told TheJournal.ie last year that he would raise the issue of conversion therapy and LGBT rights with Pence. The Taoiseach said he would raise the “wider issue” of LGBT rights with Pence, if he had the opportunity. “I am told Vice President Pence is not a supporter of conversion therapy even though some people have mentioned he is. But I imagine I will have the opportunity, I am going to be meeting him over breakfast on Friday morning, so if I have the opportunity I will certainly be mentioning the wider issue of equal rights and freedoms for LGBT citizens,” Varadkar said last March. The US vice president describes himself as a “Christian, a conservative and a Republican” and has been criticised for his views and his legislative record on LGBT issues. After last year’s private meeting, Varadkar said that he had privately spoken to the Pence family about LGBT rights. “I did privately get to speak to them about equality bout my support for equal rights for women and the LGBT community in America and Ireland,” Varadkar said. Pence also told Varadkar last year that the Taoiseach’s partner, Matt Barrett, would be welcome in Pence’s home if he decides to attend this year’s St Patrick’s Day visit to the US. It is not yet confirmed if Barrett will be attending this year’s St Patrick’s Day celebrations in Washington DC. Yesterday, the Taoiseach was forced to delay his travel plans after moves were afoot with Brexit. However, after a press conference this morning, ahead of the Brexit vote in Westminster, the Taoiseach travelled to the States, touching down in the US just a few hours ago. The plane was not WiFi enabled so Varadkar was left in the dark as the vote result came in. He is yet to comment on the result, though he is expected to speak to the Irish media in Washington DC tomorrow. Tánaiste Simon Coveney told RTE this evening that the focus now has to be on London because that is “where the crisis is and that is where the solutions need to come from”. TheJournal.ie’s Political Correspondent Christina Finn will be bringing you all the latest updates from Leo Varadkar’s visit to Washington DC this week, including his meeting with US President Donald Trump on Thursday. Email “Breakfast meeting between Taoiseach and US Vice President Mike Pence will be open to the media this year”. Feedback on “Breakfast meeting between Taoiseach and US Vice President Mike Pence will be open to the media this year”.